Bus services are provided by the Toronto Transit Commission (TTC, web site: www.toronto.ca/ttc/). 192 Airport Rocket route provides all-day express bus service between Kipling Station Subway Station on the Bloor-Danforth Subway Line and Toronto Pearson International Airport YYZ. Travel time- 20 minutes. Service: 6:00 a.m. and 2:00 a.m.
58A Malton route provides bus service between Lawrence West Subway Station (Spadina Subway Line) and Toronto Airport. Service time: 6:00 am. and 2:00 am. 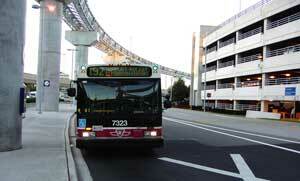 307 Eglinton West route provides overnight bus service between Yonge Street and Eglinton Avenue and Toronto Airport. GO Transit (web site: www.gotransit.com) operates buses from Toronto Pearson Airport to York Mills and Yorkdale subway stations. The Airport Express (web site: www.torontoairportexpress.com) is a 24-hour service running from Toronto Pearson Airport YYZ to downtown Toronto and several downtown hotels. Bus 7 from Toronto Pearson Airport YYZ to Mississauga City Centre Transit Terminal (at Square One Shopping Centre).